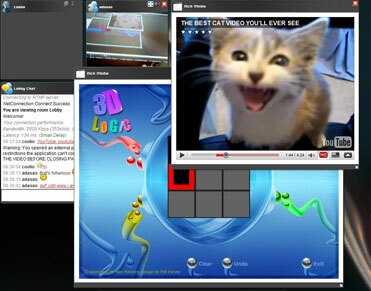 VideoWhisper Video Conference is a modern web based multiple way video chat and real time file sharing tool. It can be used stand alone or integrated as extra feature to existing sites. Find on this page: demo, site integration, user features, webmaster features, archiving (recording), screen sharing, layout changes, supported rtmp servers and more. Configuration (conference rooms, settings) and user interface (skins, icons, sounds) are loaded from external files that can be edited or replaced allowing webmasters and developers to easily customize the user experience and integrate with various content and member management scripts. The best way to see it in action is with the online video conference software demo . Just click the Enter Chat button and you'll be able to test all features online. If you do not provide an username it will automatically generate a GuestYYYY name for you. To fully test the functionality of this software you will need a standard computer with webcam and microphone, any operating system with a browser with latest flash plugin and a decent internet connection. If you are using a regular ADSL internet connection do not use very high quality settings for your webcam streaming as ADSL has low upload speed. If broadcasted webcam stream is wide, it will not be able to upload all data stream to the streaming server, causing frame loss and interruptions. You can also evaluate it using the demos for other editions (i.e. Joomla): demo links and details are available on each edition page. Both for Red5 and FMIS all live streams can be recorded as flv files for archiving purposes if enabled in RTMP application settings . In fact this can be done for all videowhisper streams. This is useful for verifying content type violation reports on sites where streaming is publicly available. If your publishers want to broadcast their screen (when playing a game, using a program, tutoring various computer skills) they can do that easily just by using a screen sharing driver that simulates a webcam from desktop contents. Read more about Screen Sharing with Flash . For more details see requirements. AVS (Adult Video Script) mod for the Adult Video Script by Envient. ClipShare mod for the Envient video sharing script. ClipBucket module for the free video sharing script. For all editions graphics and sounds are loaded from external PNG & MP3 files. Source code for all PHP files is included and also for the FMIS .asc file. Full mode licenses include all editions, with no additional costs. Also all can be downloaded for free (limited) and used for integrations / development. More details about parameters and integrations are availble on the php edition page (that usually implements latest version). Also see the VideoWhisper Session Administrator tool that could be integrated as backend feature for your projects. Video conference panels can be moved and resized realtime during run time by each user. Additionally, the webmaster can change their default startup positions and sizes. An alert panel will show with a text code that contains the panel properties (positions and sizes). Just copy this code and paste it as the layout code settings. Make sure you resize the alert panel to get all code. Different video conference software editions have different ways to configure this layout code.